Hey guys! Just wanted to do a quick post today regarding this awesome hair repair treatment that actually works. I recently had my friend take me super blonde and my hair was needing some major repair (What we do for blonde hair, right?) 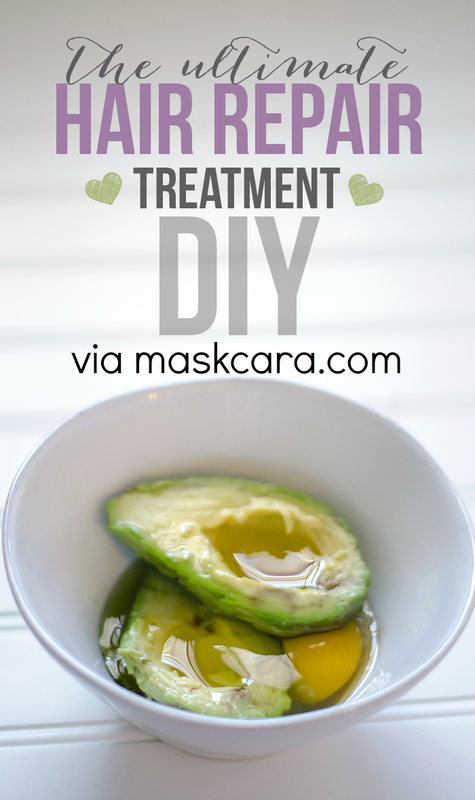 Cara, from maskcara.com, posted this treatment on her blog a few days ago and I knew if it was coming from her then I would have great results. Before I get into the details let me tell you a little bit about the glorious Maskcara. Now back to this treatment. You can read her original post about it HERE which includes an explanation of how these 4 ingredients strengthen, shine, and smooth your tresses. *I don't have a blender here at the hotel so I mashed with a fork and stirred as best I could (avocado was still a little lumpy). *Apply from ends up to the roots. Let sit for 15 minutes, then rinse and wash well. *It feels weird and kinda rough after you wash it (due to the protein), but nice and smooth once your hair is dry. *After I applied it I panicked because I thought the green mixture would tint my white blonde highlights, but no worries! Still nice a blonde! My hair felt stronger and a lot smoother after doing this. It also seems to have more shine! I'll definitely be repeating this treatment! Hope you guys try it and love it, and I also hope you will start following Maskcara and love her work as much as I do! Here are a few tutorials/tips that I really like of hers: VS Fashion Show, Eye Brow Filling , IIID Foundation Tutorials , Before and Afters , and as I am linking these up I am realizing that I could add like 50 more so I am just going to stop now and hope that you go check it all out for yourself! You are so sweet!!! I am so glad we are cousins!!! I just wish you lived closer! Thanks so much for this post you totally made my day!!! !